50,000 years ago, a tiny, but devastatingly bright pinhole appeared in the clear blue eastern sky over the green brown grassland of northern Arizona. It grew quickly into a roaring fireball plummeting to the earth. In moments that “dot”- a 150 foot meteorite – would strike the earth with the force of 2 ½ million tons of TNT. The resulting impact would vaporize almost all of the meteorite, burn the plains clean of vegetation within five miles, and destroy or seriously injure all life within 25 miles of the impact zone. But, most impressively, the touchdown left one of the most pristine examples of an impact crater still existing on earth. 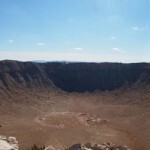 The crater, known alternately as “Meteor Crater”, “Barringer’s Crater” and the “Canyon Diablo Crater”, was thought to be unlucky by Native Americans who were aware of its existence, but avoided it entirely. Later scientists, who doubted the concept of “meteor impacts,” would surmise that the crater was the result of a volcanic steam explosion. It wasn’t until Daniel Barringer purchased the site in 1903 that the truth was finally acknowledged. Barringer was the first to theorize that the crater was made by an impact from space, and his purchase was actually a claim to mine the site where he hoped he would find the prized iron from which he believed the crater was made. Unfortunately, since most of the meteor was vaporized upon entry and impact, he never found much iron in the crater and actually died pretty much penniless. But today, his family is thriving as Meteor Crater ranks as one of the top five most visited sites in Arizona. They offer hourly guided tours each day around the rim and even offer private tours around the entire rim to customers who make a reservation in advance (and tip generously). The tours provide insight into the history AND science of the meteorite. Today, there are approximately 210 confirmed “impact” craters on earth. The largest in the United States is the area that is now the Chesapeake Bay. The world’s most well-known is the Chicxulub crater in the Mexico’s Yucutan Peninsula. It is the latter crater that scientists now believe caused the extinction of the dinosaurs 65 million years ago. Meteor Crater remains the most well-preserved of the craters available for view in the world, definitely something for the bucket list. Click here for more information.